Case IH's Puma tractors and LBX large square balers are the ideal package for large-scale haymakers - with the power, performance and capacity to make more bales per hour, while ensuring optimum safety in storage and transportation. 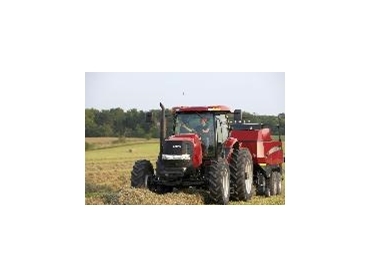 All models in the Puma tractor range feature an Engine Power Management system, which automatically matches engine power to PTO implement requirements, resulting in optimum baler output. Lower operator fatigue and high productivity result from the Puma’s full Powershift transmission that eliminates manual shifting and stopping to change ranges. Optimum forward speed can always be selected by the operator, resulting in more bales per hour. In addition, the Puma’s high clearance drawbar and front axle ensure crop flows evenly and smoothly, preventing formation of uneven windrows and crop bunching. There are two models in the LBX large square baler range. They are built for high capacity baling - producing dense, high quality bales no matter what crop – hay, straw or silage. Bale sizes range from 80 x 90cm on the LBX332 model to 90 x 120cm on the LBX432. Bale length across both models measures 1.2 to 2.7m. “Along with obvious performance benefits of the Puma and LBX package, we’ve also designed these products with safety in mind,” said Geoff Rendell, Case IH Hay and Harvest Product Manager. “According to the Australian Fodder Industry Association (AFIA) there were over 400 hay fires in southern Australia last hay season. These fires are often the result of excess surface moisture trapped in the hay at the time of baling,” explained Geoff Rendell. The moisture sensor is located on the bale chamber and senses crop moisture between 10 and 80%. This information is then displayed on the in-cab monitor. The operator is able to make an informed decision on the crops fitness to bale without leaving the cab. In addition, the LBX range is designed to automatically maintain bale density by adjusting hydraulic pressure on the top and sides of the bale as crop and moisture conditions change, again helping with safe storage at optimum moisture. To help operators prepare for a big baling season ahead, Case IH has a range of special offers on its LBX balers and Puma tractors. For orders received before 31 August, a low Case Credit finance rate of 6.45% is available on LBX balers. On Puma tractors there are no repayments till Feb 2010.